The “first” Afghan War, a CIA war in response to 9/11, was directed by the CIA Station Chief in Islamabad. It put Hamid Karzai in power in 88 days. “If you want an insider’s account of the first American-Afghan War, you can’t do better than this…Important reading to understand where we are today” (Library Journal). From his preparation of the original, post-9/11 war plan, approved by President Bush, through to “final” fleeting victory, Robert Grenier relates the tale of the “southern campaign,” which drove al-Qa’ida and the Taliban from Kandahar, its capital, in an astonishing eighty-eight days. “With his ringside seat as the senior agency official stationed closest to Afghanistan, Grenier is able to describe meeting by meeting, sometimes phone call after phone call, how events unfolded” (The New York Times). In his gripping account, we meet: General Tommy Franks, who bridles at CIA control of “his” war; General “Jafar Amin,” a gruff Pakistani intelligence officer who saves Grenier from committing career suicide; Maleeha Lodhi, Pakistan’s brilliant ambassador to the US, who tries to warn her government of the al-Qa’ida threat; and Hamid Karzai, the puzzling anti-Taliban insurgent, a man with elements of greatness, petulance, and moods. With suspense and insight, Grenier details his very personal struggles and triumphs. 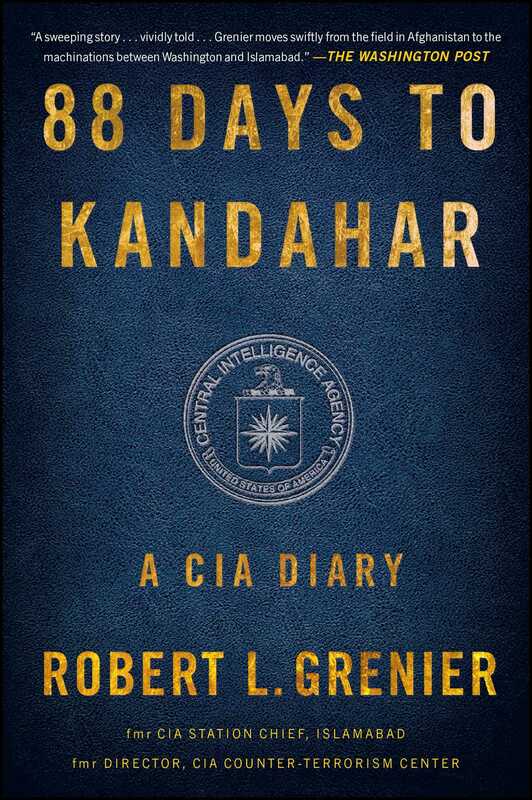 88 Days to Kandahar is “an action-packed tale, rich in implication, of the post-9/11 race to unseat the Taliban and rout al-Qaida in Afghanistan” (Kirkus Reviews). SUSPENDED IN THE HAZY netherworld between sleep and wakefulness, I gradually became aware of an irritating sound somewhere near my head. It took a few seconds to orient myself. I was in my bedroom, safe behind bolted steel doors. The sound was coming from the secure phone on the nightstand. The clock indicated I’d gone to bed just four hours before. “Did I wake you up, son?” It was the unmistakable voice of George Tenet. I wasn’t much in the habit of being awakened by the director, but what caught my attention was being called “son.” George wasn’t all that much older than me. “Listen, Bob,” he began, after our encrypted phones had synched up. “We’re meeting tomorrow morning at Camp David to discuss our war strategy for Afghanistan. These questions had been troubling me for the twelve days since September 11, while the situation in Afghanistan rapidly evolved. As the CIA station chief in Islamabad, the capital of Pakistan, for the past two years, I was responsible for all U.S. clandestine intelligence activities in both Pakistan and Taliban-controlled Afghanistan—fully 90 percent of the country. For two years, it was my job to lead the men and women charged with ferreting out the region’s secrets and penetrating its mysteries. I had devoted nearly every waking minute to understanding problems: the rivalry between India and Pakistan over Kashmir; Pakistan’s covert support to terrorist groups; its construction and proliferation of nuclear weapons and long-range missiles; the plans and intentions of Pakistan’s military dictator, General Musharraf; and, most important, the terrorist enterprise of Osama bin Laden and its relations with the Taliban, the Afghan religious student movement that dominated the country and provided him with safehaven and support. Now, after 9/11, I knew that it would no longer be enough to report on problems. As the senior CIA officer on the scene, I would have to try to solve them. For a few days after 9/11, CIA Headquarters in Langley, Virginia, had gone silent. The normal flow of secret message traffic had dwindled to a trickle. It was as though the American giant had been staggered. Then, in the days immediately preceding George’s call, the giant had come back to life, and Langley was pummeling me with questions and demands. We were facing the imminent prospect of a U.S. invasion of Afghanistan. I had visions of large numbers of U.S. troops operating in a vast and difficult terrain, trying in vain to find and strike an evanescent enemy, with no defined targets and no clear long-term objectives. This seemed like a prescription for a Soviet-style Afghan disaster. Just a few days before, on September 19, one of my officers had gathered our first piece of “smoking gun” evidence of al-Qa’ida’s responsibility for the 9/11 attacks. Our best source on the Afghan Arabs—an agent who had been carefully vetted and whose information had been fully corroborated dozens of times—had attended a meeting of over 100 Arab fighters hosted by bin Laden near Jalalabad, in northeastern Afghanistan. Contradicting his previous public denials of responsibility for 9/11, in this private gathering Shaykh Osama had taken full and triumpant credit for the attacks. He exulted over what he said was an imminent U.S. invasion of Afghanistan, which would at last draw the Americans into open combat and surely lead to their defeat. I shared the desire to deal with bin Laden once and for all; but I also feared that if we acted carelessly, his prediction could prove accurate. As George was talking, my mind was focused on President George W. Bush’s State of the Union speech three days before, on September 20. Speaking before the joint houses of Congress, with British prime minister Tony Blair in attendance, the president had laid the cornerstone of a conceptual framework to guide the way forward. The speech had been replete with demands and ultimatums for the Taliban: Turn over Osama bin Laden; close the terrorist training camps and subject them to international inspection; deliver all terrorist fighters associated with bin Laden to competent foreign authorities. Failure to do so, Bush said, would condemn the Taliban to share the terrorists’ fate. Hidden in that hard message, however, was a ray of hope and the possibility of redemption. The president was drawing a line in the sands of time. As of 9/11, he was saying, the rules of the game had changed. Henceforth, nations and subnational groups who acted as sponsors of terrorism would be held to account. There was an implicit opportunity for erstwhile terrorist sponsors to reject terrorist tactics and those responsible for them. That opportunity was the message I thought we should extend to elements of the Taliban, and to all Afghans willing to break with the Taliban policies of the past. Reinforced by the international solidarity which had immediately manifested itself after 9/11, that positive message would guide our policy, and provide the justification and the rationale we would need as we took what would most likely be the tough military actions necessary to bring al-Qa’ida to heel and to deny it safehaven. “The President has set the policy for us in his speech,” I said. “In effect, he has invited the Taliban to join the international coalition against terrorism. “We shouldn’t think about this primarily in military terms. What’s important is for us to focus on our political goals in Afghanistan. We can’t permanently rule the country ourselves. Everything we do should be consistent with the long-term need to create a new political dispensation in Afghanistan, one willing to drive out the Arabs and to keep them out. Any military means we employ should be designed to serve and to reinforce our political objectives. “We begin with Mullah Omar. Our initial demands focus on him. If he refuses to change policy, to break with bin Laden, we hit him. That serves notice on the others in the Taliban leadership, who have never much liked bin Laden or the Arabs anyway. We extend the promise and the ultimatum to them, and if they refuse, we have the rationale to hit them too.” George stopped me with questions. I told him I could. As I sat at my desk to write, it was as if I were merely transcribing something I could see plainly in my head. This was breaking all the rules. No one knew that better. Every CIA officer is taught that we are never to be “policy prescriptive.” CIA’s job is to inform policy, never to make it. I had just spent three years as chief of “the Farm,” the Clandestine Service’s equivalent of West Point for the Army and Parris Island for the Marines, where it was my job to make sure that the next generation of CIA officers knew its proper place in the world. And yet here I was, purposefully violating one of the cardinal rules I had spent a career upholding. There wasn’t an approved format for the piece I was writing. I framed it as an “Aardwolf,” CIA’s code name for a chief of station field appraisal. Such appraisals, analytic pieces from senior CIA representatives abroad, are relatively rare, prepared only in response to watershed events. They get a lot of attention from high levels in the executive branch. I knew the senior reports officers at CIA Headquarters, who normally reviewed all incoming intelligence reports for conformity to format and adherence to the rules, would not be pleased when they saw a field appraisal specifically intended to prescribe policy. Their ranks traditionally dominated by women, the senior reports cadres were sometimes waggishly referred to, sotto voce, as “the Sisterhood.” To me they were the Vestals, the guardians of the flame. But they wouldn’t get a vote. They would see this chief of station field appraisal, but only after the fact: it was going directly to Tenet, outside normal channels, for his own use with the cabinet principals. I banged out the piece, eight pages, in three hours. By the time I was finished, all my senior guys were in the office, and I circulated the draft to them, made modifications based on their comments, and sent it on to the director’s security staff with instructions to hand it to him as soon as he awakened. It would be days before I learned of its fate. George had reviewed it at five in the morning and had immediately sent copies to the full War Cabinet, who used it as the point of departure for their discussions, held without the president present, that Sunday morning. The principals presented their conclusions to the president in the White House Situation Room the following day and, after more discussion, the eight-page document was approved by President Bush as the conceptual template for the war effort. Tenet was directed to put me in touch with General Tommy Franks, the head of Central Command (CENTCOM), and the senior combatant commander charged with leading the Afghan campaign, to make sure his war plan conformed. Later that week, at a meeting with a UK official in Islamabad, he told me that my report had been briefed to the British Cabinet. “You’ve got the silver pen!” he said. I regard that cable as the best three hours of work I ever did in a twenty-seven-year career. The mere fact that a CIA field officer was asked to write it, to say nothing of the fact that it was adopted as policy, is extraordinary. Despite its flaws, it anticipated many of the problems with which the United States and its allies are struggling now in Afghanistan, over a decade on, and it suggested remedies—some followed, some not; some effective, some not. Adopted at an early point when opinions were still malleable, it established many of the key assumptions that governed the conduct of the early campaign in Afghanistan—sometimes, admittedly, to an extent more literal than was helpful. But those assumptions reflected the eternal verities of Afghanistan, as America has subsequently learned to its cost. Thirteen years have passed since 9/11. The improbably quick victory won by small numbers of CIA and Special Forces operatives allied with anti-Taliban dissidents in what we might call the First American-Afghan War has nearly faded from memory. Our “victory” proved short-lived. After a pause of perhaps three years, the United States again found itself at war with the Taliban in what we might call the Second American-Afghan War. Only this time, the comparatively modest objectives of the first war had been replaced with an over-ambitious set of millennial nation-building goals which Americans could not achieve and Afghans could not sustain. Many of the principles of my cable, which guided the American effort in the first war, had long been abandoned by the start of the second. The original plan postulated that while the United States should support the Northern Alliance—the collection of Afghan minorities who traditionally opposed the Taliban and were locked in a civil war with it—we should strictly avoid the perception that we were entering a civil war on their side. To do so would cause the restive and more numerous Pashtuns, from whom the Taliban was drawn, to coalesce firmly against us. Instead, any effort against the Taliban must include dissident Pashtun elements, beginning if possible within the Taliban itself. I asserted firm rules of conduct: America must keep its military footprint in Afghanistan small; it should eschew permanent bases; the U.S. effort should always be in support of Afghans, rather than the other way around; most important, the American quest to deny Afghan sanctuary to international terrorists should conform to the political culture of the country, rather than fall into the trap of trying to change it. The second war is coming to an end. There will be no victory in this war, illusory or otherwise. Having concluded, correctly, that the prospects for success in the terms it had originally defined are too remote, and the associated costs far too high, the Obama administration has decided to withdraw substantially from Afghanistan. This recalibration of the U.S. posture in South-Central Asia would be welcome if it were conducted in support of a viable and sustainable long-term American engagement in the region. Instead, the planned post-2014 American military posture in Afghanistan is merely a cover for what the U.S. government actually intends: the abandonment of Afghanistan. If America’s problems in South-Central Asia were confined to Afghanistan itself, the situation would not be so dire. But the U.S. invasion of Afghanistan and its aftermath have unleashed forces within neighboring Pakistan that have further radicalized that country and undermined the political and social underpinnings of a nuclear-armed state of some 180 million people. America’s obsession with Afghanistan has put our country’s far more important interests in Pakistan in serious jeopardy. Now, having caused more harm than good by trying to do too much, we are set to compound our errors by doing too little. The challenges that confront us today are remarkably similar to those we faced in the immediate aftermath of 9/11. Afghanistan is again reverting to civil war, and the religiously inspired radicalism that provided an incubator for the 9/11 terrorists is, if anything, stronger in both Afghanistan and Pakistan than when we were attacked. As it has done before, America is trying to wash its hands of South-Central Asia. As before, that may not be so easy, and we may not be able to live with the consequences of our abandonment. For those who will be charged with future U.S. policy in the region, greater acquaintance with the history surrounding America’s first direct military involvement in Afghanistan, and the reasoning that led to our initial successes there, might well usefully inform their—and our—judgments as we prepare for the possibility of yet another phase of our Afghan adventure. It is my hope that a grasp of the practical lessons learned by this writer and his colleagues in the First American-Afghan War, and an understanding of how our distraction from those lessons led to the failure of the Second, will yet prove to be of use as and when America and its allies are forced to embark upon a Third.